Ceiling fans can be great electricity savers during summer months if your electricity bills are high due to high air conditioning load. There is significant amount of electricity that this small appliance can save and can help you avoid air conditioner. But it is not a magic wand to save electricity. It is very important to have a right kind of ceiling fan installed with its right maintenance and operations. A poorly installed fan of bad quality can waste a lot of electricity.Ceiling fans do not change space air temperature; instead they move the air around to change the thermal sensation of the occupants of the room. Fans move the air around the human body or the occupants in the room and the air takes off the heat surrounding the human body. It also helps in evaporation of the sweat which makes a human feel cooler. This makes a human feel 2 to 4 degree centigrade cooler. With very less electricity consumption (very less units consumed in electricity bill), a ceiling fan can give good comfort in warm and humid climates. If the rooms are bigger it is better to install multiple ceiling fans. 2) Blade Pitch: A flat blade just slices through the air and does not assist air movement, so it is important that a blade of a ceiling fan is tilted at least 12 to 15 degrees. The angle assists air movement. It is also important to note that if pitch increases beyond 12-15 degree centigrade, the efficiency of motor running the fan decreases thus increasing electricity bills. BEE (Bureau of Energy Efficiency) launched a star rating scheme for ceiling fans in year 2006. It has currently only rated fans with size of 1200 mm and minimum air delivery of 210 cu m/min. The rating is given on basis of an indicator called “Service Value” which is ratio of air delivery (in cu m/min) to the power input. Greater the service value, higher the efficiency. We at Bijli Bachao received some feedback that BEE higher star rated ceiling fans do not give good air, so we would like to suggest that one should look at higher service value along with higher air delivery to select appropriate ceiling fan. It is also important to note that the star rating changes every year as the technology improves. So a five star rated fan in 2006 may not be as efficient as five star rated fan in 2011, so it is important to note the service value and air delivery as well. 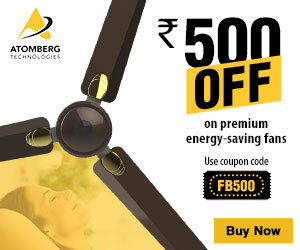 Typically inefficient fans are of about 80 watts and efficient ones are of about 45 watts, thus switching to efficient one can save about 45% electricity. Care should also be taken while installing ceiling fans. It should be installed at least 2.0 to 3.0 meters above the floor and there should be at least 24 inches space between the blade and the ceiling. If the space is not proper, the air delivery will not be right. Care should specially be taken when putting ceiling fans on false ceilings. Make sure that there is enough space between the blades and false ceilings. In case the ceilings are very high, extended mounts should be used. 1) Ceiling fan’s motor should be lubricated regularly to ensure smooth operation. Motors with sealed bearing require little or no maintenance and thus no lubrication. 2) If the fan is vibrating or is making too much noise then it is not working efficiently. Typically a fan with a metallic container for the motor vibrates less and lasts longer. Efficiency can also be improved by changing the ball bearings inside the fan if it is making a lot of noise. 3) Never interchange blades of the ceiling fans as the manufacturers ship the product after balancing the blades for right operation. Interchanging blades may reduce efficiency of the fan. 4) Use Step type switching (instead of knob type) electronic fan regulator and save 30 % power. The old box type regulator only regulates the air breeze but the fan is consuming full power only. 5) It is also important to keep a check on the electric controls for a ceiling fan to make sure the speeds are varying on change; else it will keep consuming electricity.